Hello traders. Welcome to the news trading course and the third module: News That Move the Market Profitably Enough For Us To Trade. 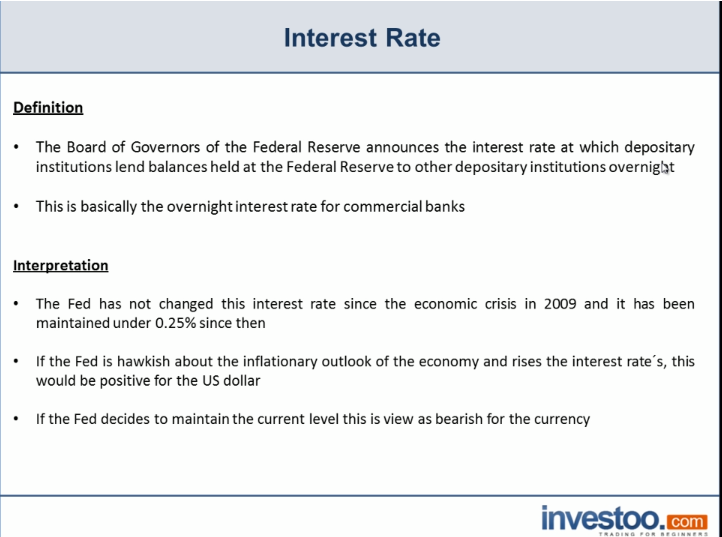 In this lesson, I’m going to focus on the interest rate or the federal funds rate. We’re going to define what this interest rate means. Then I’m going to show you the implications of the decision of maintaining the interest rate or hiking it. And later on, I’m going to show you how to trade it. But first of all, let’s start by defining what this interest rate means. The Board of Governors of the Federal Reserve announces the interest rate at which depository institutions lend balances held at the Federal Reserve to other depository institutions overnight. So basically, this is the overnight interest rate for commercial banks. And this is the first point that I want to make and it’s quite important because this is not the commercial interest rate at which you would lend money to a bank. This is the rate at which banks lend money to each other overnight. Now, the Fed has not changed this interest rate since the economic crisis in 2009, and it has been maintained under 0.25% since then. Another point that I want to make is because of the economic crisis and because of the increase of unemployment and because of the deflation in the economy, the interest rate or the federal fund rate has been maintained above 0 and others 0.25%. If the Fed is hawkish about the inflationary outlook of the economy and raises the interest rate, this would be positive for the US dollar. What I want for you to understand right here is that a hike in the interest rate is a tool to maintain inflation at point by the Fed hawks. A hawk is a voting member that only focus on inflation, okay? Not on the overall development of the economy. If the Fed decides to maintain the current level, this is viewed as bearish verticals [SP]. Now, how are we going to read this number? The federal fund rate decision is very important for traders because when it’s released, we get an outlook of the Feds view of the US economy. Now, this is important. Let’s say that the Fed decides to hike the interest rate or the federal funds rate. This means that the Fed sees an improvement in the US economy. Now, if the Fed decides to hike the interest rate, this would mean that savers will start benefiting from its savings but borrowers might have a little tough time. And of course, a hike in the interest rate will also be an immediate hard blow for investors because of the relation between interest rate and the cost of borrowing capital for businesses. But right now, we’re going to focus on the US dollar and we are going to trade this economic event with the US dollar. So if we see a hike in the federal funds rate, this is going to be bullish for the US dollar, we are going to look to buy the US dollar. This interest rate decision is always released with a FMOC statement about it, okay? And this is important. Because this interest rate hasn’t been modified since 2009, our traders focus always on the small changes in this statement. Now, let’s say that on the next interest rate decision release, we see that the Fed decides to maintain the 0.25% rate, but on the statement, they say that they see a growth in the economy and they might start hiking the rate at the next meeting. This is going to be extremely bullish for the US dollar even though the interest rate was maintained at this meeting. Now, how are we going to trade this? As you can see, this is kind of an interesting event because of the subtlety of the federal funds rate, and of course, the statement released with it. First of all, we are never going to front run the news. Even though we know that it’s very possible the Fed won’t hide the interest rate, we are not going to front run it. Now, this economic event is pretty straight forward. If this interest rate is hiked, we are going to look to buy the US dollar. If the interest rate remains unchanged, we are going to look at the report. If the report states a possible hike in the future, we are going to buy the US dollar. If the report is vague in when the rates will start to get hiked, we will sell the currency. Because if the Fed is vague on the future of the federal fund rate, it means that it doesn’t have a good outlook for the US economy and it wants to maintain the interest rate below 0.25%. So we are going to use corrections and consolidations to trade this event because it’s very volatile and because its trades are going to be based on a report mostly, not on number.